Unable to recharge. Get the following error and have for almost 24 hours now. App Not Responding: The app you\'re using isn\'t responding. Please try again. If you keep seeing this error, try again in a few hours. My title keeps flashing even after I check it out seeing the new additions your have made. It won\'t stop flashing. Check marked the boxes and unchecked the boxes. Rather annoying. I can select the amount to recharge, however upon clicking NEXT, error pops up. 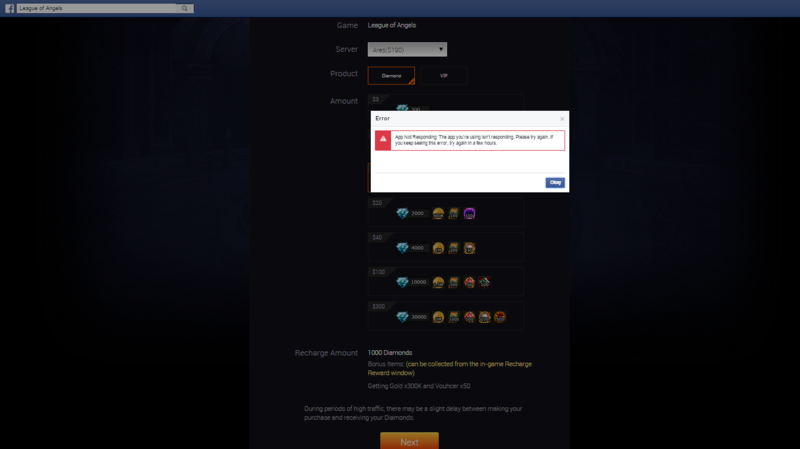 First issue: Unable to recharge - supply your ign and server. Second Issue: Flashing icons - devs are aware of it. Well, it\'s been 28 hours and still can\'t recharge. Looks like I\'m able to recharge again. ;Thank you. Dear Players, it seems you are both on facebook platform try contacting them about this. If it still won´t be resolved by them then another Jr.FM who will be on their shift will report it for you. 2019-4-20 05:04 GMT+8 , Processed in 0.063650 second(s), 52 queries .